Photo by Amy Halverson on Flickr. TED Global was way more than stunning talks. In fact, maybe the best thing was the unique blend of inspirational people I met. One of them, artist Candy Chang, makes public installations I’m sure many of you will appreciate. Her business card says Candy likes to make cities more comfortable for people. Many of her projects close the gap between the public and the often almost intangible stuff that surrounds them. Her work connects people and asks for their contribution. What to do with abandoned buildings? There’re hundreds of them in every city (especially once you start looking for them). For one specific building, the Polaris Building in Fairbanks, people were asked just that question. Plus, they were asked to tell their stories about the building. There’s also a website attached that asks for contributions in a refreshingly simple way. The number of contributions is overwhelming and I’m sure this will influence the future of the building. This project also takes on vacated buildings with the help of the public. 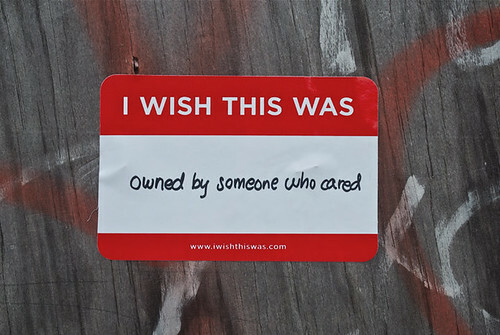 People can leave special stickers on empty storefronts to express their wishes for specific businesses or services. Policy makers can use the input to make policy (obviously), or even better: entrepreneurs can find a place to start their business. 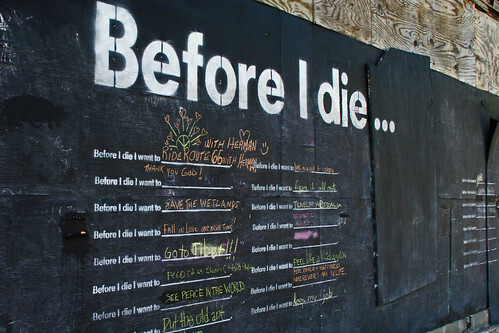 The website collects examples of people’s wishes. Photo by Jason McDermott on Flickr. Photo by Ed Merritt on Flickr. People who’ve been following me know I firmly believe a museum should exist in the public space. In fact, any cultural institutions should. Physically, and in public debates. Candy Chang’s work does exactly this, and through its pleasing aesthetic simplicity it’s also museumish. Be sure to check out her website to find more great projects.